RatTail Antenna Booster with Typical Handheld Radio. 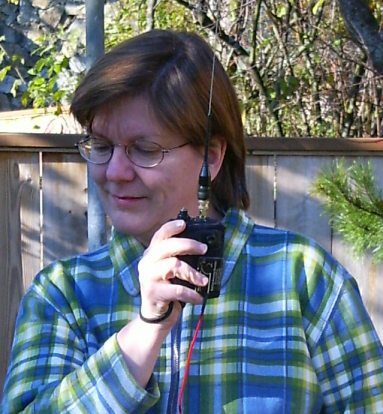 Using the RatTail on handheld radio to increase emergency communication range! The RatTail Antenna Booster is a patented technology. 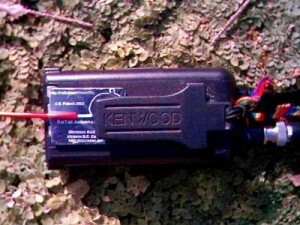 This passive device attaches to a handheld radio operating in the VHF Bands . Custom versions are available for 6 Meter Band, Marine, Aircraft or up to frequencies as high as 250 mhz. It makes a great improvement to Marine and Aircraft handhelds where the rubber antenna is very inefficient. An increase in transmitted energy of 9 to 12db (800% – 1600%) is seen when measured at a distance of 2 kilometers or more. This increase results from a transformation of your radio’s 1/4 wave vertical antenna to a 1/2 wave dipole antenna. Thus more energy is delivered to the horizon. This makes it very useful for emergency rescue operations where rescue workers are having difficulty getting their message through to a base station. Boaters will double their range from a small craft to land. This device only works on handheld radios. 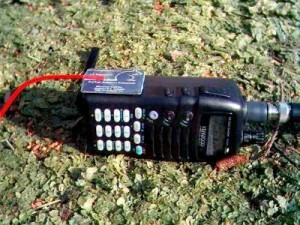 A 5 watt handheld radio becomes effectively like a 20 or 40 watt radio, thus increasing its ability to get a signal through. Received sensitivity is also increased by the same amount. Our pricing is $31.95. Its handmade for reliability by workers in Victoria BC Canada who are making and testing by hand for the emergency communication market. We had some units made overseas in the last 2 years but we had great difficulties with quality and reliability of the units. We have decided to focus on the Marine and Aircraft emergency communication market which demands the quality and reliability that hand assembly and testing guarantees. Our price reflects our traditional hand construction / tuning methods that have made the Rattail famous in the radio world. To purchase Marine Radio Version $31.95 … click link below to buy. To purchase Aircraft Radio Version $31.95 click link below to buy. Marine, Aircraft and other Radio Manufacturers and Distributors can email us for OEM and Wholesale Pricing. Have you ever been ALMOST able to get into your favourite amateur or commercial repeater, an IRLP node or an Echo Link system that is just a bit too far away? The Rattail Antenna Booster will often turn a marginal signal into a great signal. How does it attach to the radio? Velcro on the back of the device allows attachment to many places on the radio. There is an optimal place to mount the RatTail on each design of radio to get the maximum increase in efficiency. The RatTail has a built-in red light in the eye of the rat. Transmitting while moving the plate around to various locations near the bottom of the radio causes the eye to glow brightest when the best mounting spot is found. The device can be mounted anywhere that is convenient, provided that the light glows brightly when you transmit. The glowing eye is essential when initially mounting the device and has no usefulness beyond selecting the mounting location. Velcro can be used for mounting securely after doing careful testing, or the RatTail can temporarily be slipped under the belt clip. 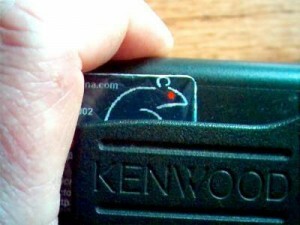 It can be rolled up and kept in the pocket when not needed, but some users prefer the velcro approach and always leave the tail attached to the radio. Below is an under-the-belt-clip mount. 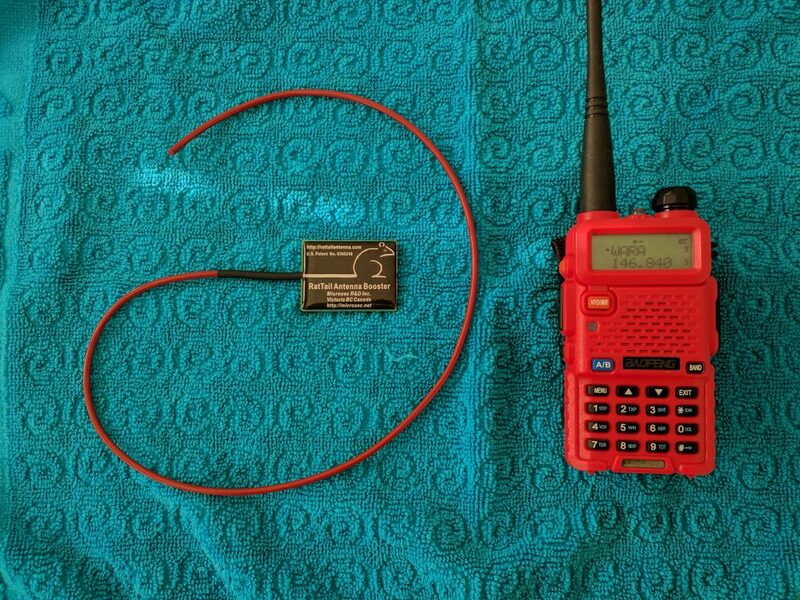 Below is shown the RatTail attached with velcro to the side of the radio, and antenna in use. I am Ian Soutar the inventor and builder. Since 2001 we have been selling hundreds of Rattails every year. There has never been a return! Its a well loved product which is also available at Universal Radio. VE7DH: My wife and I were “given” Rat Tail antenna boosters by the local inventor at a HAM club meeting. He explained to the members at the meeting how the rat tail worked and used a signal strength meter with a very large meter movement to show it off. Basically what it looks like is the other half of a vertical dipole capacitively couple to the case of the hand held. The signal reaching the far device is almost a couple of S units higher. For under $30 you have boosted your 2m hand held enormously without an external antenna and the weight, bulk, and cost of more batteries. It’s a simple concept elegantly carried out. I highly recommend it. KG7AV: For the price, figured I couldn’t go wrong giving it a shot. Picked up the first one over a year ago, and certainly works as advertised. It became a staple among my HT accessories in my field / go kit. Ended up adding another as a spare. Especially when out hunting in the boonies of Eastern Oregon, it has made the difference between hitting and not hitting repeaters. 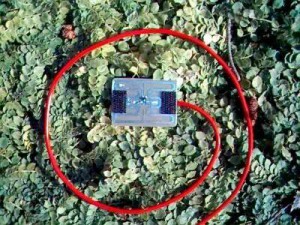 KB1ILH: This device, if placed in the optimal location, will stabilize a shaky signal on both transmit and receive. It will need to hang freely from your HT in order to do its job which is to provide a “better” 2M antenna ground” than you do already with your body. It is typically attached to your HT with a 1″x1″ velcro pad. It seems to add the most value when used with your typically poor-performing “rubber duck” antennas. It only works across VHF 2M ham, VHF marine, and VHF Aircraft frequencies. Transmit enhancement is typically about 800% as measured at 2 km with a second radio. The radiation pattern from a handheld radio is not normally horizontal, so much energy is lost to the sky. The RatTail lowers the radiation pattern to make it almost horizontal so that much more energy is delivered to the distant radio. When measured across the room a measurement of the power increase will not be as high as that but about 400%. Reception sensitivity is increased by 400% to 800% to help pull in signals from distant radios. In addition to boosting the antenna power output it also matches the antenna more closely to the radio. The result is lower battery consumption on some radios on high power. Also since it is possible to use lower power settings, all radios will benefit from this by extending their operating time. This feature allows emergency operations to be carried out for longer periods without the need to stop for battery maintenance. On a Dual Band ham radio the stock antenna is a compromise antenna that has about a 12db loss as compared to a proper 2m rubber antenna. The RatTail typically restores the dual band’s 2M efficiency to that of a full 1/4 wave vertical. In all the dual band radios we tested there was an astonishing 18db improvement on 2M. This represents a 16 times or 1600% improvement. For the first time Dual band operation on both 2M and 70cm can be equally efficient without the need to change antennas. Because the Rattail Antenna Booster attaches to the bottom of the radio, unlike other devices that connect to the BNC connector, the RatTail cannot damage the antenna or BNC mounting. If it gets pulled it simply pops off the radio without doing any harm. The RatTail Antenna Booster came out of experimentation by the Victoria Communications Club in about 1996. The club consists of a dozen people who get together once a month to chat at a coffee shop. Some of the members are inventors and radio professionals. Until November 2011 we supported mainly the Amateur Radio Community. From now on the focus will be Marine / Aircraft as well as Amateur radio. Microsec R&D Inc.: Electronic Product Development. Nickel Iron Battery Association: Nickel Iron Battery and History. Radiation Hormesis Scientific Site: Healthbenefits of low level nuclear radiation. Radiant-Beads.com: Radiation Hormesis Tools for sale. For other topics see the Menu at top of each page.